This Log Home Seminar could change your life. It’s a pretty big statement but then again buying a log or timber frame home is a pretty big deal. And with all big decisions in life, understanding what’s involved can kickstart your dream into action. We’ve seen it over and over again: people who didn’t think they could afford a custom log home from Confederation that realized they could. People who assumed we only build the plans on our site learn that every home we build is custom. And that’s included in The Total Log & Timber Frame Package. That’s why we created this seminar. Sure we’d love to create the perfect log home for you today, but this is about education. Because we know that the more you understand, the easier it is to make good decisions. Do you have any questions, or want something covered in our seminar? Let us know! We care about your privacy and will never share your email. Unsubscribe anytime. We'll use your email to send event details, special offers for seminar attendees only and other helpful info. Options for constructing your home and ways to save money and time. 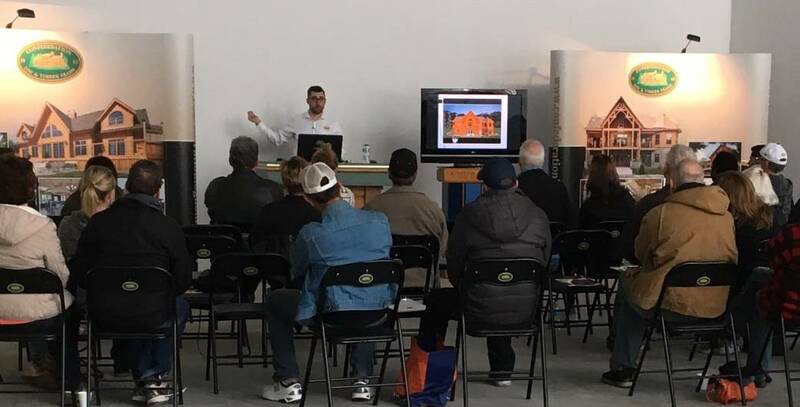 We’ll match the $1,500 design deposit for any seminar attendee who decides to begin the design process following the seminar. That means that you now have $3,000 to put toward your new log home! It’s only available at the seminar, so it’s worth keeping in mind. Trust: Meet the family and the team who will share their 35+ years of experience and expertise to create the perfect home and experience for your family. Confidence: Meet our Chief Designer and experience a 3D walkthrough of a custom plan and really see how to be 100% sure about your plan. Knowledge: See our inventory of Northern White pines patiently undergoing their drying phase and learn why that’s so important. Excitement: See a house being cut and assembled in our modern manufacturing facility and learn about the lengths we go to to ensure 100% satisfaction. Comfort: Tour our model, grab a bite to eat and get answers to your questions in an easy going setting. Register today for our next seminar (our last one sold out)! How many seminar attendees would recommend the seminar to a friend or relative interested in a log home? Did we mention that we are located in one of the prettiest and most popular cottage towns in Ontario? Many attendees make a day or weekend out of it. We’ll send you all the info you need in our confirmation email. Please note there is a $10 per person cost - 100% of which is donated to the local food bank. 9:00 - 9:15am: Arrive and enjoy coffee and a bite to eat. 9:30 - 11:00am: There’s lots to cover so we start right on time and take a short coffee break part way through. Learn how you’ll get the perfect design, construction, budgeting and more. 11:00am: The tour begins. See our Design Department, see the value of a real-time walk-through, tour our production facility and log storage area. Noon: Join us for a casual lunch in our model home. Ask questions of our team one-on-one.